Herewith, the second installment in the forum in response to Thomas Geoghegan’s essay, “What Would Keynes Do?” Read yesterday’s installment here. I am sympathetic to much of Tom Geoghegan’s piece. It is often said that there are two types of economists: those who believe in accounting identities and those who don’t; and unfortunately, those in policy positions fall primarily in the latter category. Geoghegan is right to point out the inescapable logic of a large trade deficit. Either we must have a large budget deficit or we must have negative private savings, as we did when the stock bubble spurred a consumption boom in the late 1990s, or—worse—when the housing bubble drove an even bigger consumption boom in the last decade. Economists who are fine with large trade deficits want either large government deficits or negative private savings, or they don’t know what they are talking about. I am also a big fan of a financial transactions tax to help rein in the bloat in the financial sector, as well as raise a ton of revenue for the government. And I would certainly not argue with Geoghegan about the merits of Medicare for all. However, I would take issue with some other items in his analysis. First, there was absolutely zero surprise with the stimulus. The best analysis we have shows that it worked almost exactly as planned. Of course as planned, it was not nearly big enough. It was designed to create to 2-3 million jobs in a context where we needed 10-12 million jobs. There is no mystery that needs to be explained. The second place I would take issue is with the role of the value of the dollar. Geoghegan seems to think that devaluing the dollar will not lower the trade deficit. In fact, movements in the trade deficit follow the course of the dollar almost perfectly. The deficit first grew large in the mid-eighties when Paul Volcker’s tight money policies sent the dollar through the roof. When the United States negotiated an orderly decline in the dollar later in the decade, the trade deficit stopped rising and rapidly shrank. We had modest trade deficits through the mid-1990s until Robert Rubin took over and pushed the high dollar. He put muscle behind this policy with his engineering of the bailout from the East Asian financial crisis in 1997. From that point forward, the East Asian countries, along with much of the rest of the developing world, adopted a policy of propping up the dollar to increase their exports to the United States. This is all 100 percent textbook. There are four obvious remedies. The first three are get the dollar down, get the dollar down and get the dollar down. Yes, we can do this. The other solution is adopt trade policies that put our highly paid professionals in direct competition with their low-paid counterparts in the developing world. This means eliminating the barriers that keep millions of qualified Chinese, Indian and Mexican doctors, lawyers, architects and other professionals out of the United States. This would not only share the pain of international competition, it would lead to large savings in medical care and other services, which in turn would raise the real wages of tens of millions of middle-class workers. Mainstream economics often has much more to offer than progressives give it credit for. The problem is that mainstream economists are just not very honest. Thomas Geoghegan doesn’t really explain why the United States has such a big trade deficit. It is surprising given that the United States is ahead of most countries in most industries technologically. Why isn’t everybody buying US high-tech goods? The answer lies in the nature of our trade deficit. The gap with the BRICs (Brazil, Russia, India and China) and other emerging economies is not in high-tech but rather in mid-tech—industries like steel, shipbuilding and semiconductors that are mature but whose demand is still growing and whose productivity is rising due to technological improvements in product design and process throughput. Our problem is, we’ve lost our mid-tech edge. As you can see from the above table, manufacturing in the United States accounts for only 12 percent of GDP, which is far below the figure for Germany and Switzerland, who continue to export mid-tech products like precision machinery and chemicals. In 1989, MIT published a landmark study, “Made in America,” that set out a path to raise manufacturing’s share by relying on high-tech. But the share continued to decline after a brief period of stabilization. We’ve lost our competitive edge in heavy-duty manufacturing, and that is reflected in our huge trade deficit. 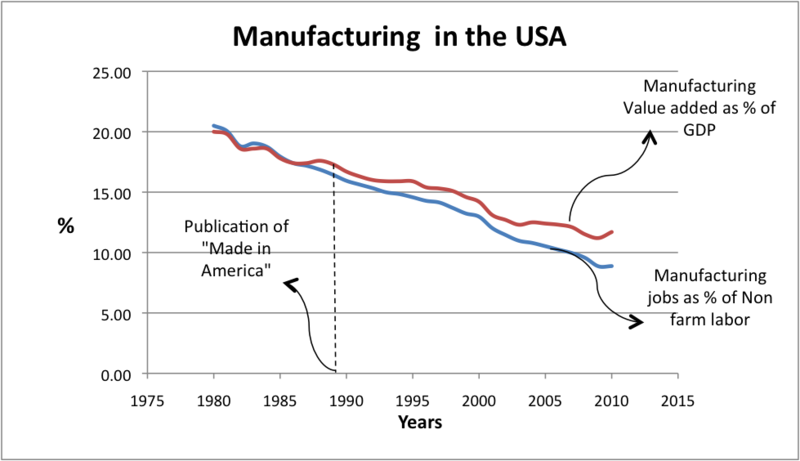 If the United States is serious about raising manufacturing employment and output, a prologue to balancing trade, it has to run on two tracks: one runs from our manufacturing problem to advanced technologies as solutions, and the other runs from our manufacturing problem to mid-tech industries, many of which are high-wage, large-scale employers. The United States has high-tech jewels, like Google and Amazon, but not first-class mid-tech firms with high employment and exports. Fortune’s 500 largest international firms (in terms of revenues) in 2008 ranked two Taiwanese electronics firms as 109th (Hon Hai) and 342nd (Quanta Computer) while Google ranked 423rd and Amazon ranked 485th. If the networks connected with these mid-tech firms were factored in, the size disparity might even be larger. This is where the jobs and exports are. Besides running on the high-tech track, the United States must ensconce itself even deeper in the culture of mid-tech to get into the minds and motivations of the world’s leading manufacturers. Only then can it also anticipate revolutionary technologies that emerge from mid-tech sectors, such as high-speed rail, a fast-growth industry with dense linkages to other sectors that has left the United States, once the railroad king, woefully behind. The shipbuilding industry is now sometimes classified as high-tech due to having achieved record rates of speed and safety in carrying hazardous cargoes. Korea is the world’s largest shipbuilder, employing upwards of 10,000 workers, having aced out Japan (but quivering at the rise of China). It began life in the 1960s, at the same time as the Brazilian shipbuilding industry, which failed. Now Brazil is trying to restart shipbuilding; Brasilia has ordered its state-owned oil company, Petrobras (ranked thirty-fourth on the Fortune 500) to source its oil tankers from local shipyards. Is it possible for the United States to start a shipbuilding industry of its own? The answer depends on the distinction between “made by Americans” and “made in America”—by foreign-owned companies from the decolonized world. Emerging economies now account for one-quarter to one-third of total world outward foreign direct investment (FDI). India invests in China (China is India’s largest export market) and China allies with Korea to invest in Indonesia; Taiwan now invests more overseas than foreign firms invest in Taiwan. The United States must rejuvenate its manufacturing sector by attracting the world’s great manufacturers to invest in the US Developed countries account for 95 percent of total FDI in the United States, but the share of manufacturing in their investments is fast falling. Keynes never wrote much about industrial policy, but it’s hard to believe he wouldn’t have heartily approved. The Keynesian emphasis on investment is particularly relevant in today’s nearly recessionary economy, and Thomas Geoghegan should be praised for bringing to our attention this important but overlooked aspect of Keynes’s thinking. My concern is that even in good times—and these certainly aren’t good times—the private sector can’t muster enough investment to lift the economy to prosperity, or even meet all of its needs. Limiting interest rates through usury laws helps, of course, in channeling private capital into the production of goods and services and away from nonproductive financial markets. But the private sector can’t do the job alone. There will still be a shortfall, even if long-term investment were made to pay off and the rich were prodded, as Geoghegan says, into putting their investment money “into the kinds of things we can sell abroad.” That will certainly be a huge help, and I hope it happens, but even in the best of times and acting with the best intentions, the private sector is not capable of generating the investment this nation needs. Government must step in with huge additional outlays. In sum, government must supplement the investment process, as it did so successfully in the 1950’s and 1960’s— and through much of our history. Notwithstanding the relentless proselytizing for markets that are free of government, the American economy was rarely capable of great success without significant public participation. Alice AmsdenAlice H. Amsden, professor of political economy at MIT, is the author of The Rise of the Rest: Challenges to the West From Late-Industrializing Countries (Oxford).